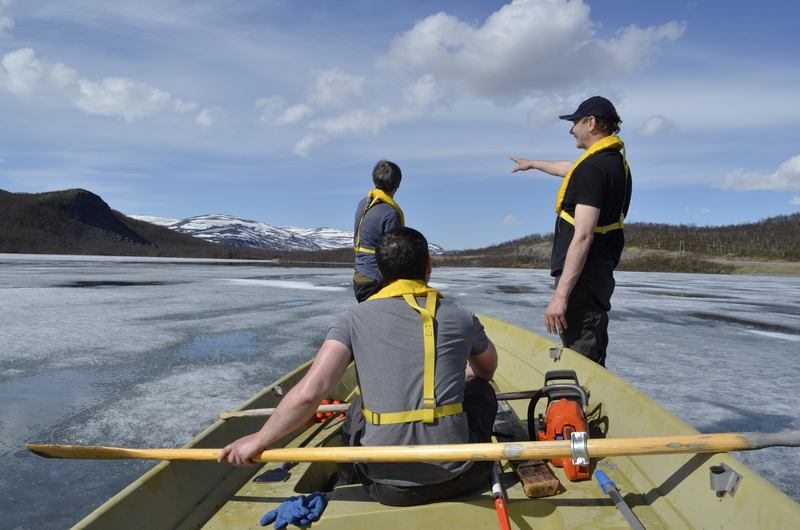 Another aspect of our field research that hasn’t been discussed in the blog is the weather. 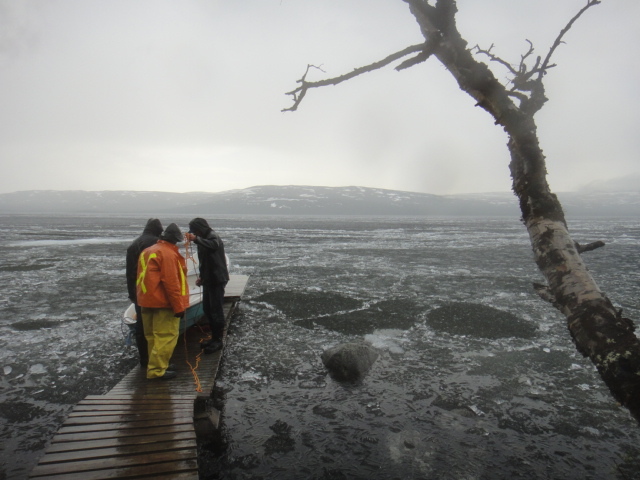 Working on an ice-covered lake, we expected cold weather, but that wasn’t exactly what we got. 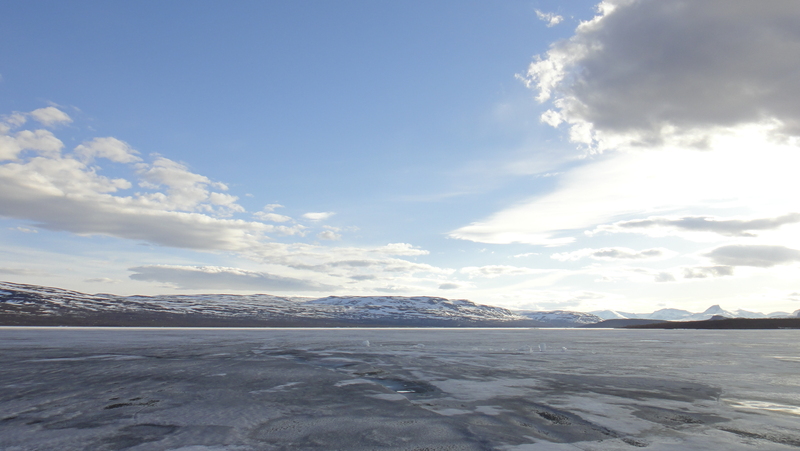 When we arrived in Kilpisjärvi, the lake was completely ice-covered and we could walk on it confidently. 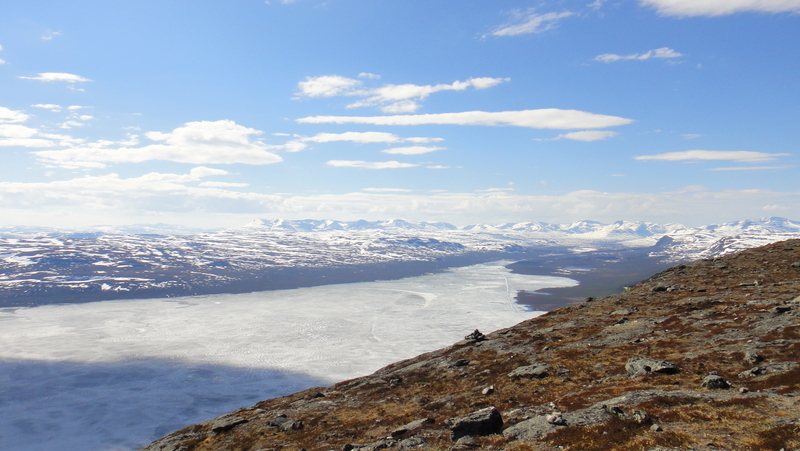 Ice-covered Kilpisjärvi on Day 1. 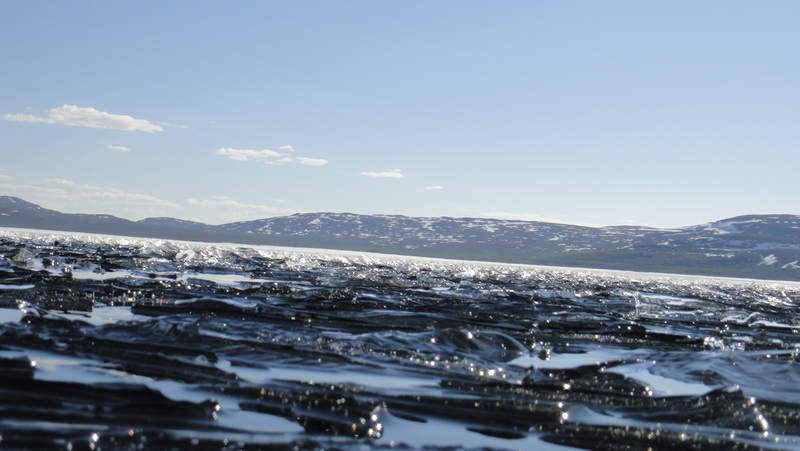 The ice-covered expanse of Kilpisjärvi. The ice was thick and stable enough that we were able to launch UBC-Gavia. 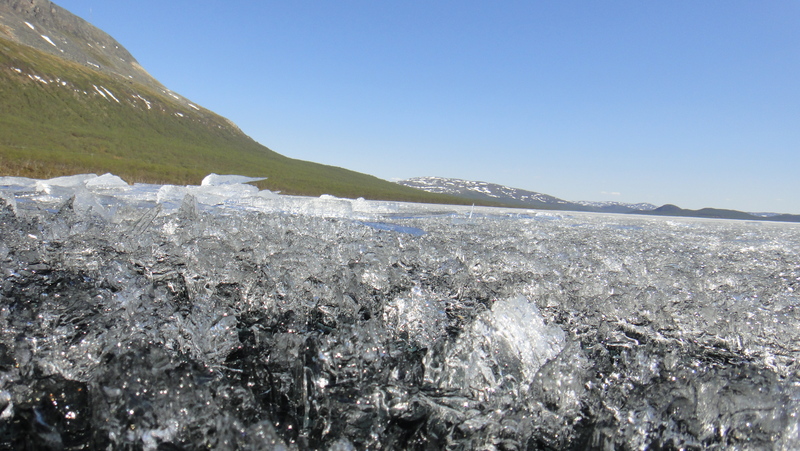 But, as the temperatures increased (sometimes above 30 degrees Celsius) the ice started to degrade quickly. The ice detached from the shore and regions of soft ice formed. 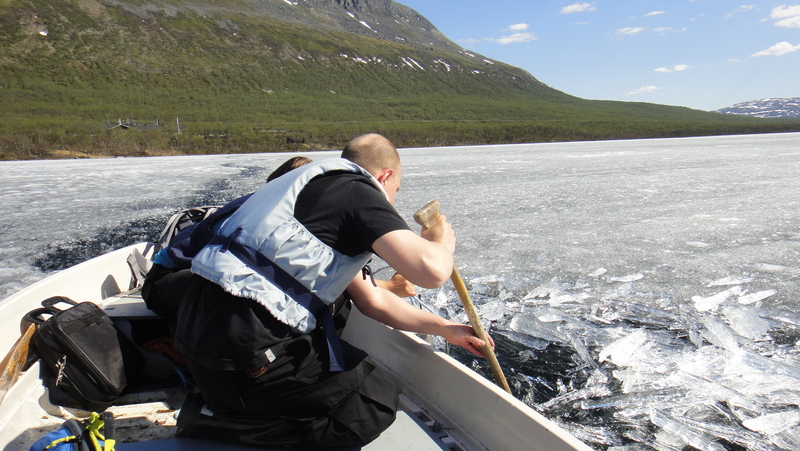 The ice was so easy to break due to its columnar structures, that Tom Kokkonen could break it apart with a canoe paddle. 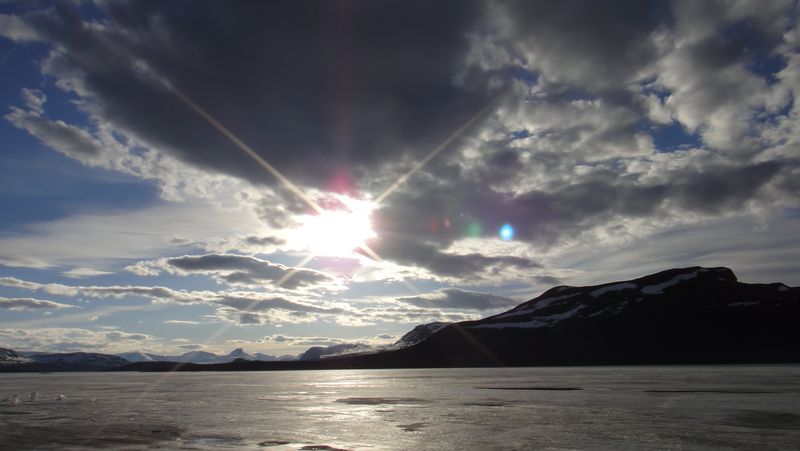 As the sun-baked the ice surface, more channels of open water formed in the ice. One day later, many channels formed. 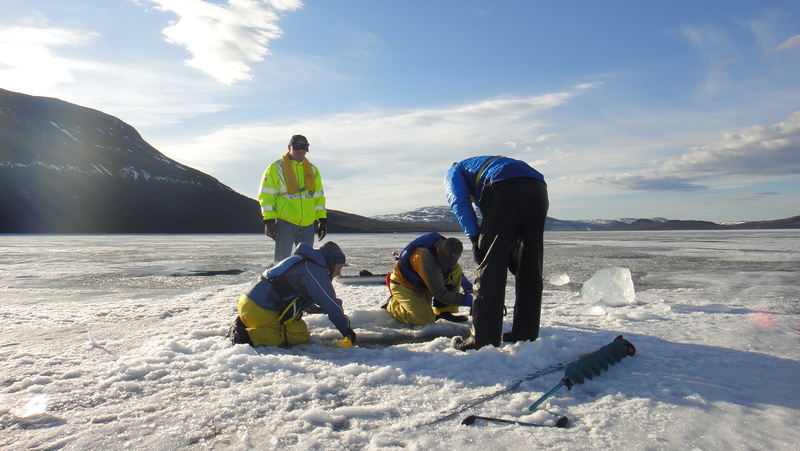 This opening of the ice was beneficial for the UBC-Gavia recovery mission as the team could search open water for her tether. 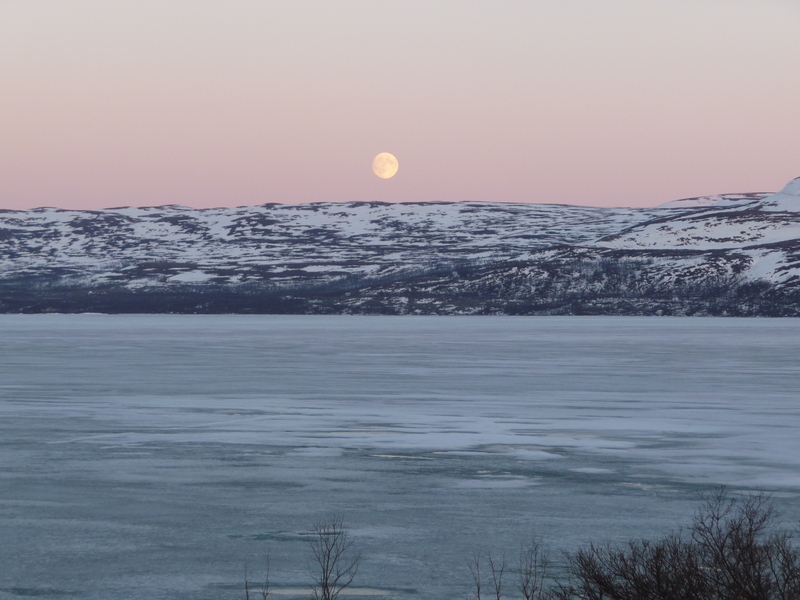 The view from the CONCUR house looking out on Kilpisjärvi. Then, the weather changed again and the fog rolled in. 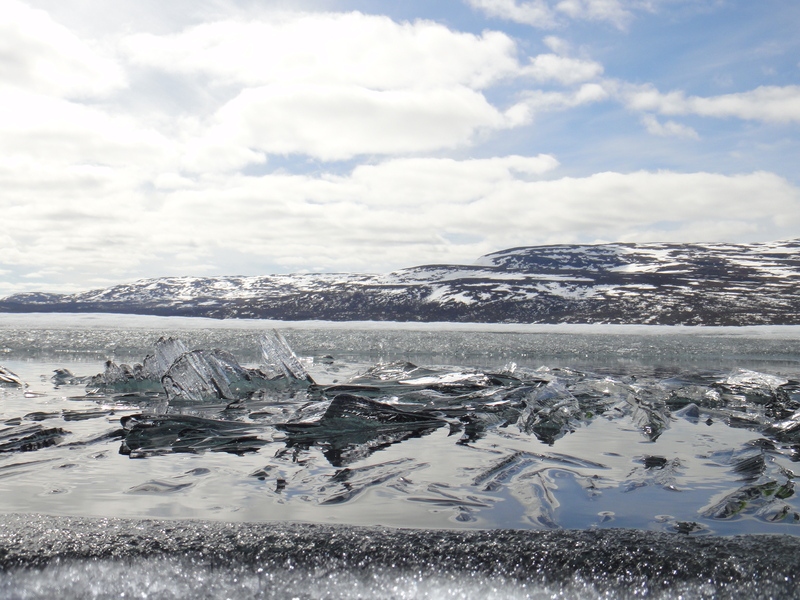 Then the wind picked up and pushed all the left over ice to our end (North) of the lake. Very wet CONCUR team members saving our boat. Then, the very next day, the lake was completely open water. 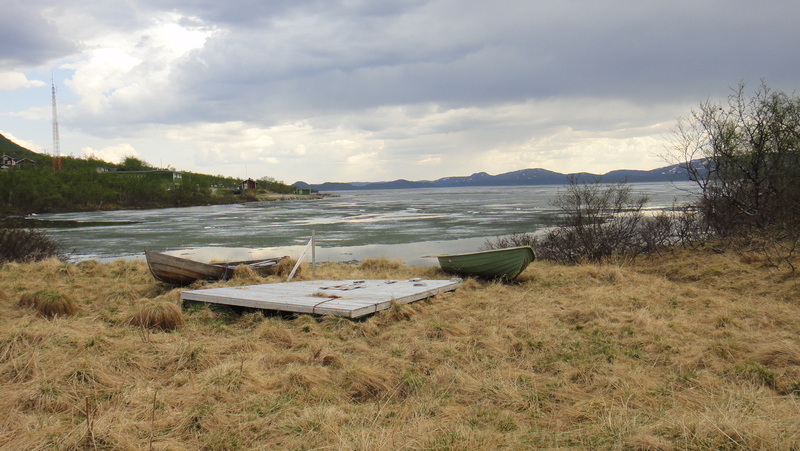 The day we left Kilpisjärvi, it looked completely different from the day we arrived. Looking down on Kilpisjärvi the day we left, not an ice-cube to be seen. So, what did we learn from this. Well, we learned to pack for every eventuality and to go with the flow, in this case the flow of ice. We couldn’t control the weather, but at least we could try to use it to our advantage. So, now I will take the opportunity to describe a lesson that everyone on the trip learned. It has to do with being out in the sun on a (partially ice-covered) lake. 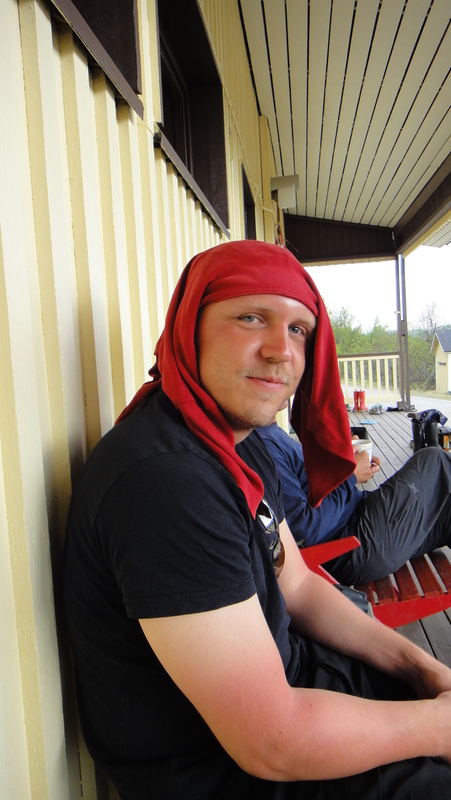 First, I will introduce Tom Kokkonen. 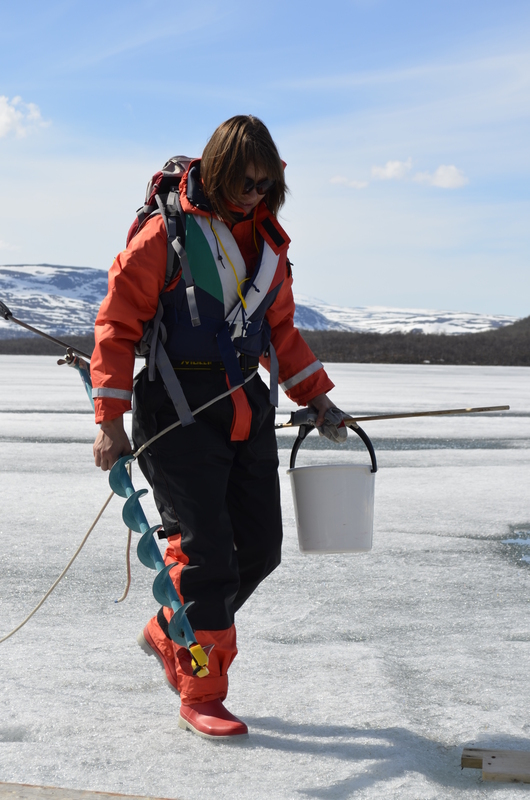 Tom is interested in river ice, don’t worry we accepted him anyway, and he came up to Kilpisjärvi to help Elisa Lindgren with her measurements. 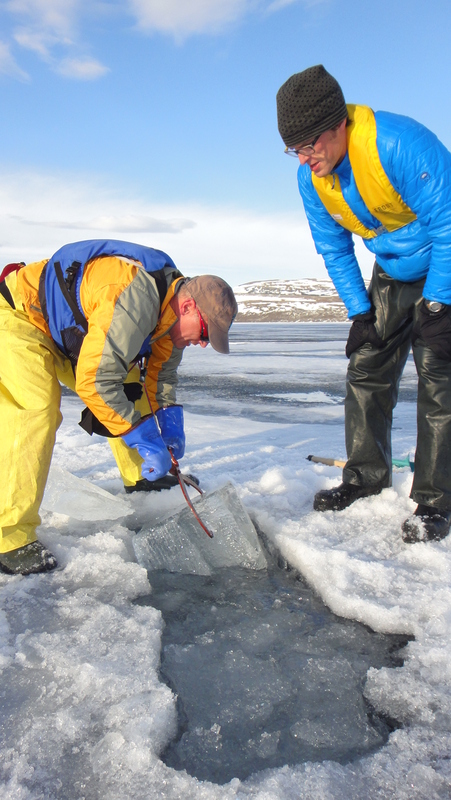 Tom Kokkonen and Elisa Lindgren making measurements on Kilpisjärvi. Tom Kokkonen trying to keep his head cool. 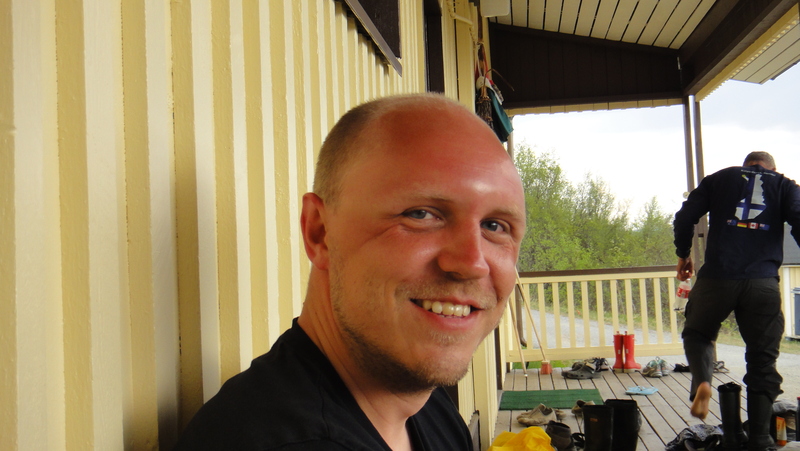 Tom Kokkonen’s sun burnt and swollen head after a day of sampling in the sun. Now, it should be noted that Tom did seek medical advice about his swollen and sun burnt head, and he was deemed fit for duty. But, we can use Tom as an example of what to do when on a lake. Wear a hat. Wear sunscreen. And, use a t-shirt dipped in Finnish lake water to keep cool. 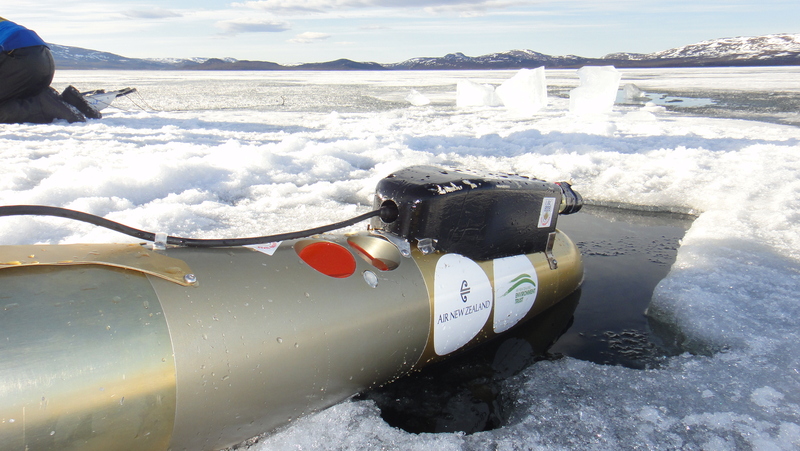 So, why did the AUV get lost? Now, that our bags are packed and many of the team members are on their way out of Finland (which makes us sad), some questions can be addressed and the real blogging can begin. This blog will address the first question that Team CONCUR has received. Which is “how and why UBC-Gavia, the AUV, got lost?”. UBC-Gavia getting ready for launch. 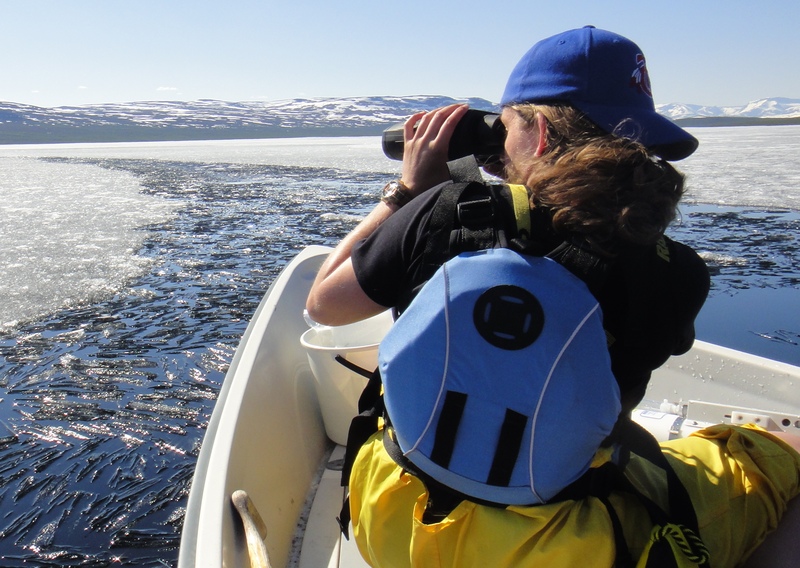 First of all, UBC-Gavia is a sophisticated piece of scientific instrumentation; however, no matter how much planning goes into her missions, once she is under the ice, many things outside of our control can happen. After we recovered UBC-Gavia, the team ran a scientific postmortem using the information that we gathered from data logs, GoPro video that was attached to the AUV, the position of the vehicle when recovered and the observations we made when we were trying to recover her. Kelly Graves and Jeff Williams with UBC-Gavia in the last photo before she went missing (UBC-Gavia, not Kelly). We won’t ever be 100% sure what happened, but here is our best guess. On her final mission, UBC-Gavia was launched under the ice and for some reason, she didn’t dive to the set depth that she was supposed to. She chose to run along the underside of the ice (this can be heard near the end of the following video, it’s the scraping sound). She continued along her mission line; however, she decided to abort. This could have been due to her not being at the set dive depth, or maybe she wanted to play hide-and-seek. To us, her abort meant that she needed to be pulled back into the hole by her tether. When we tried to do this, she came towards the hole a little. But, then all of a sudden she stopped and we could no longer pull on the rope. From this point on, we had no way of getting UBC-Gavia out. Alex Forrest and Jeff Williams trying to guide UBC-Gavia home. From the GoPro video, and the observation that we couldn’t hear her using the hydrophone, it appears that when we were pulling her towards us, she popped up into an open hole in the ice and sat in the ice. This prevented the hydrophone pingers to work in the water. Normally, we would have been able to free UBC-Gavia from this hole, but there were also knots in her tether line that got stuck in the ice. This is what we think finally did us in and had UBC-Gavia dead in the water. 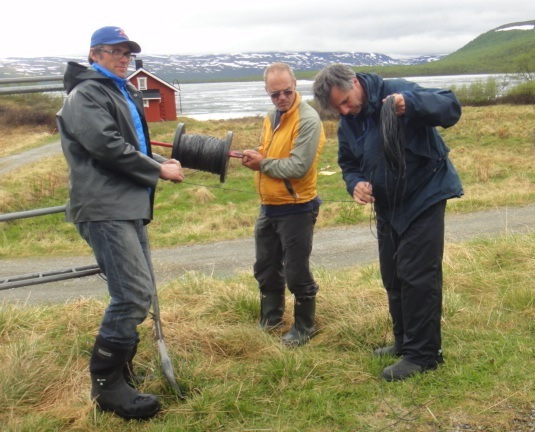 Alex Forrest, Larry Kost and Christof Engelhardt working their way through the knotted and tangled tether (this was one of the most painful tasks of the expedition). It wasn’t until the ice had finally started to break up and melt that we could see the line to save UBC-Gavia, but boy are we ever happy that the ice started to melt. Kelly Graves a little too happy to have UBC-Gavia back, or maybe it was the exhaustion. More questions and lessons learned to come in future posts. Most of the CONCUR team came to Finland expecting cold weather and packed accordingly. The rooms here at the house we are staying at are filled with suitcases overflowing with warm jackets, thermal underwear and gloves. However, since we arrived, the weather has been quite warm. Sometimes, it has been above 30 degrees Celsius (and I am not talking about the temperature inside a float suit). So, as strange as it may seem, many of us have been in shorts and t-shirts. Even the odd pair of flip-flops has been worn (and no toes were lost due to frostbite). But Team Berlin (Will Rizk, Christof Engelhardt and Georgiy Kirillin) has to take the cake for arctic field gear. 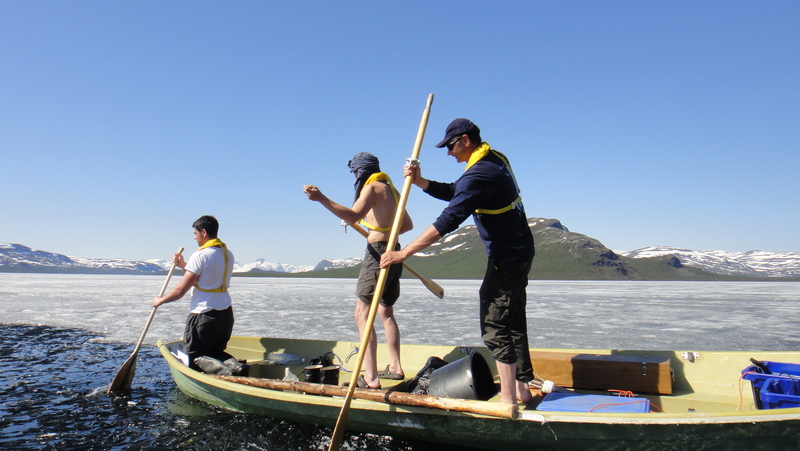 Will Rizk, Christof Engelhardt and Georgiy Kirillin (Team Berlin) looking like they are paddling the Nile, not across an ice-covered Kilpisjärvi. Tiede (science) is serious stuff. It is important to document what is being done for research purposes as well as raise public awareness of scientific research. So, photos have always been an important part of field work. One example of a famous “science pose” is biologist Edward Nelson with his handy-dandy instruments from the 1911 Scott expedition to the South Pole. 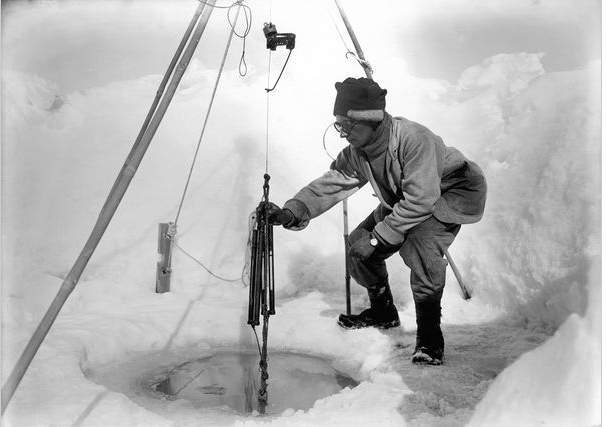 Photo of biologist Edward Nelson conducting experiments on the Scott Expedition (Taken from the National Geographic Website http://news.nationalgeographic.com). Some scientists, some we know better than others, like to emulate Nelson’s famous pose. Alex Forrest channeling Edward Nelson while conducting CTD casts. Other scientists prefer more action shots of themselves making measurements and doing work. 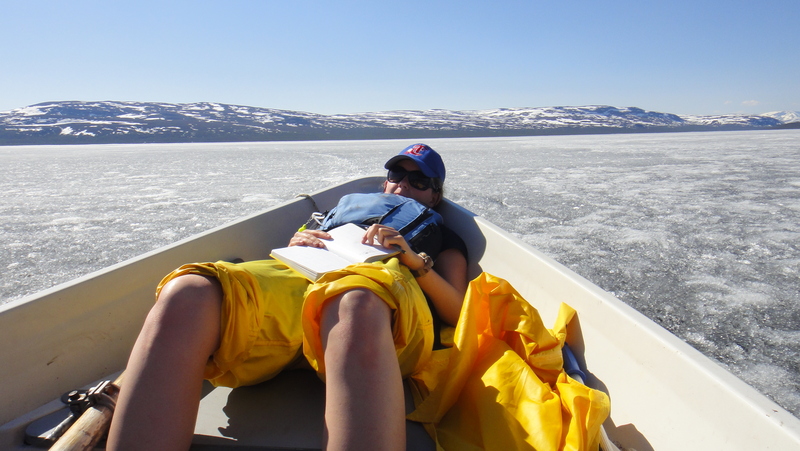 Elisa Lindgren working hard in her float suit (it was 20 degrees Celsius out at the time). In this field expedition, quite a bit of pointing goes on as well. Georgiy Kirillin pointing the way for Christof Engelhardt and Will Rizk. Christof Engelhardt pointing the other way for Will Rizk and Georgiy Kirillin. 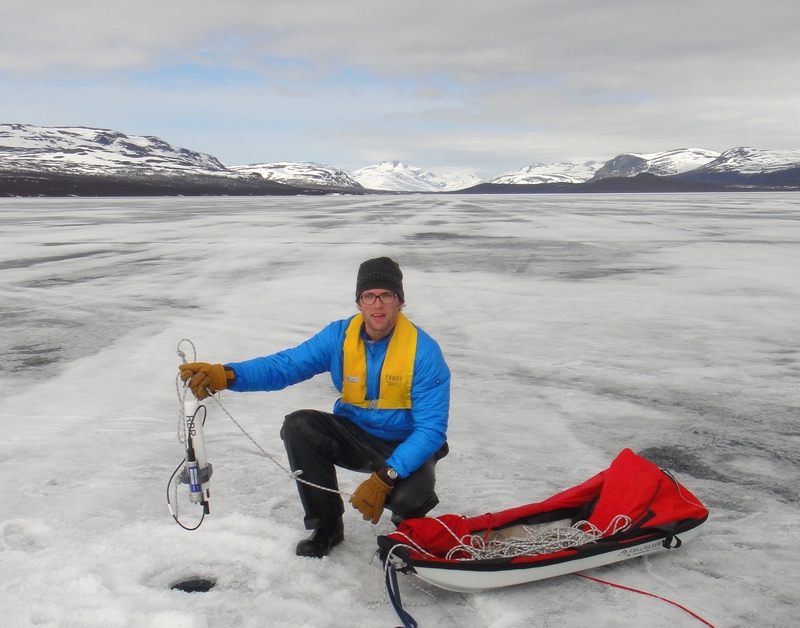 Other scientists like to pose with things, or in our case more important equipment. Kelly Graves and Jeff Williams posing with UBC-Gavia (the team member everyone actually cares about). 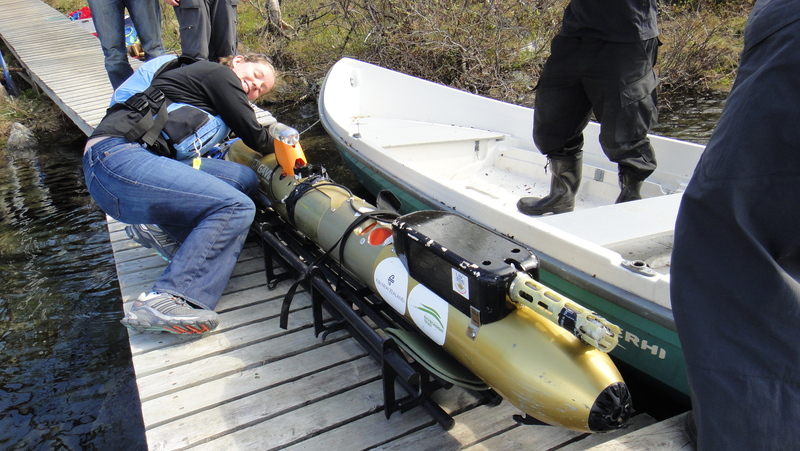 How to recover a missing Autonomous Underwater Vehicle! For those who are familiar with CONCUR, you may have realized that we haven’t been mentioning one major part of the expedition. Our autonomous underwater vehicle (AUV)! So, here is the story of why we have been quiet on that front. First, let’s meet our AUV. 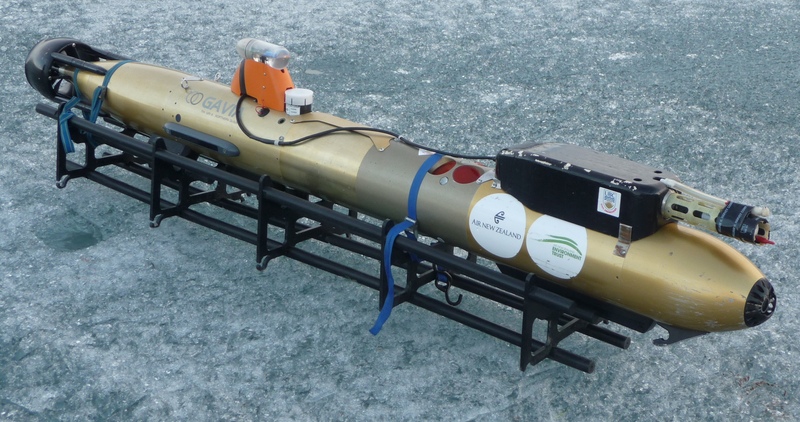 UBC-Gavia is an autonomous underwater vehicle which is essentially a pick-up truck to carry around scientific instruments to difficult locations, such as under-ice. 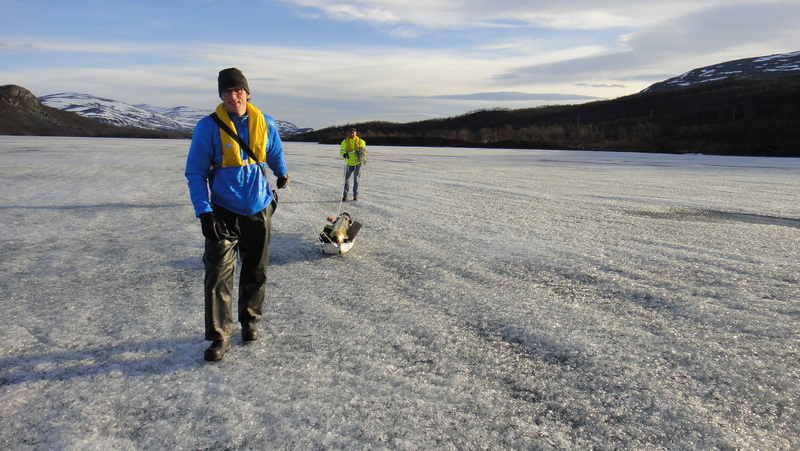 To run a mission using UBC-Gavia, first we had to haul her out onto the ice. Alex Forrest and Jeff Williams giving UBC-Gavia a lift across the ice. Then an ice hole big enough for launch was cut. Larry Kost and Alex Forrest making a nice big ice hole for UBC-Gavia to launch through. “So that is what the it looks like under there, huh.” Team UBC-Gavia (Kelly Graves, Jeff Williams, Larry Kost and Alex Forrest) preparing the ice hole for launch. Then, when all systems are a go, we launched. Jeff Williams waiting to launch and hoping he wouldn’t sneeze. We launched 3 missions and she returned for 3 times. She popped up right back in the hole each time. 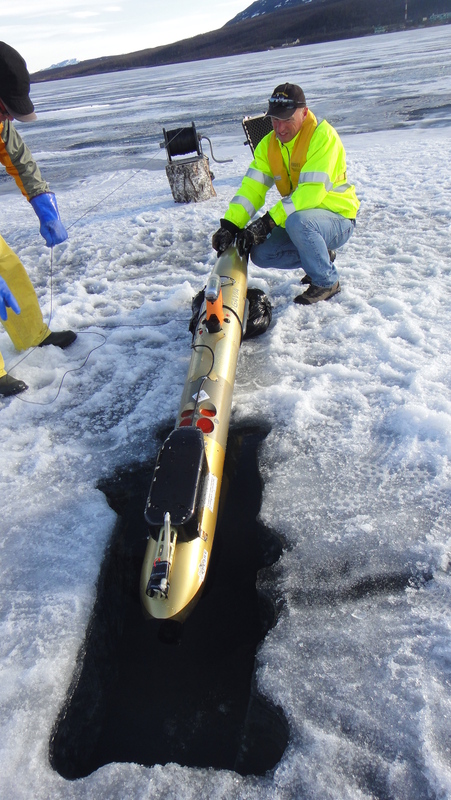 UBC-Gavia making a re-appearance under the ice post-mission. Then, on the fourth mission, she decided not to come back (we were a little insulted). We tried pulling on the tether, but nothing would give. So, we went into search mode. 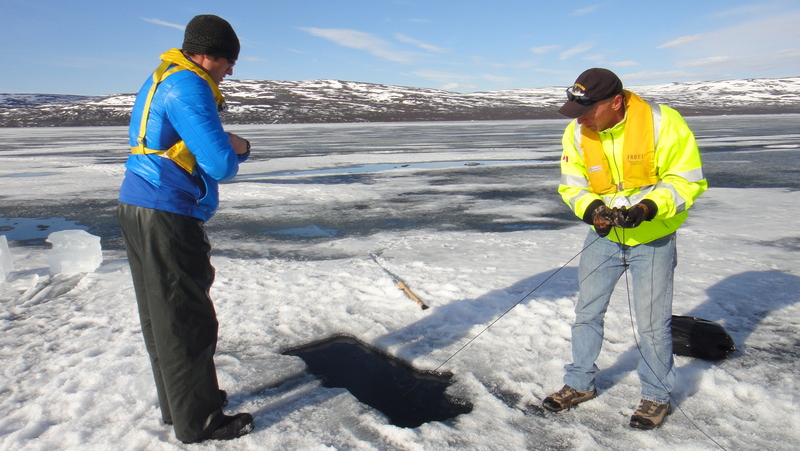 First, a foot search was launched on the ice. 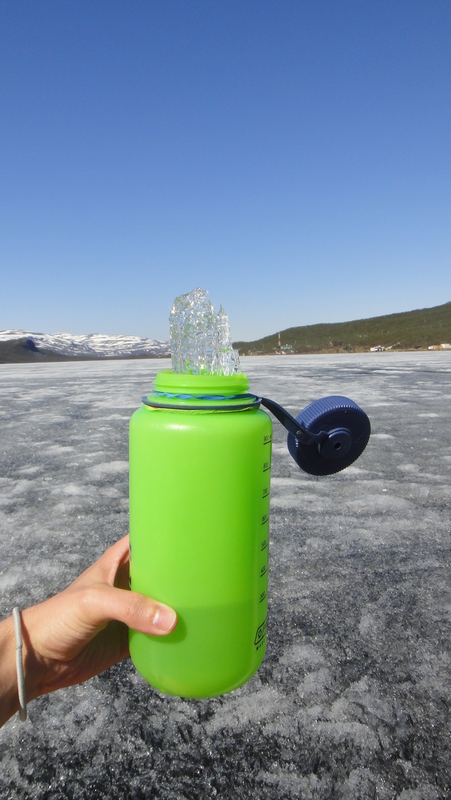 Using this method relied on the avalanche beacon, but this method had to be aborted due to poor ice conditions. So, we tried to find her by using a hydrophone from shore. The hydrophone should have been able to pick up the pings that come from the pingers that are tucked into her communication tower. Kelly Graves and Alex Forrest attempting to hear UBC-Gavia, unfortunately she was shy. 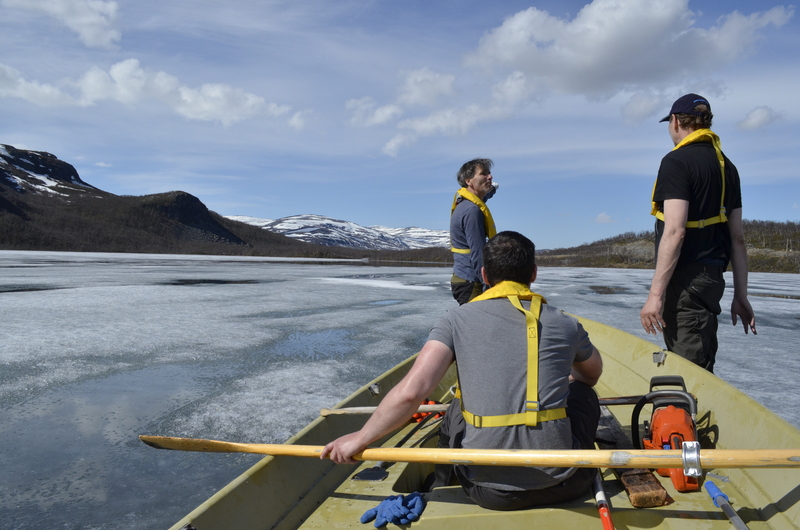 The hydrophone wasn’t giving us any great response from shore, so we paddled out to the ice edge and listened again. Jeff Williams and Kelly Graves going for a leisurely paddle to listen for UBC-Gavia, to no avail. 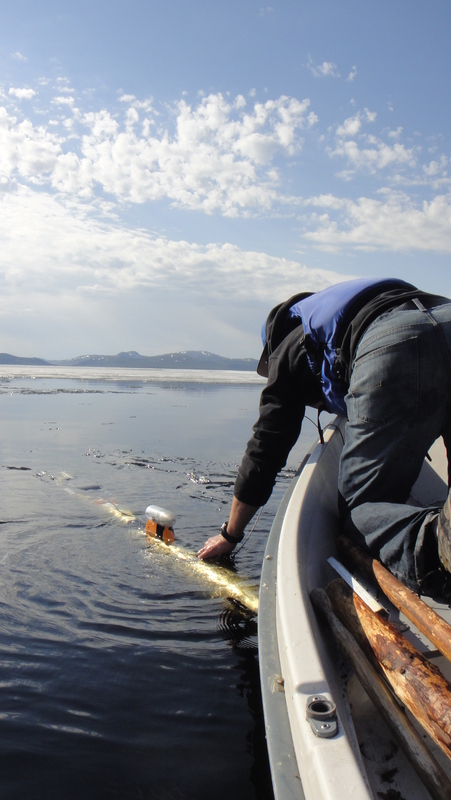 The next day, a mission was launched to see if we could get closer to where we guesstimated she was to use the hydrophone again. 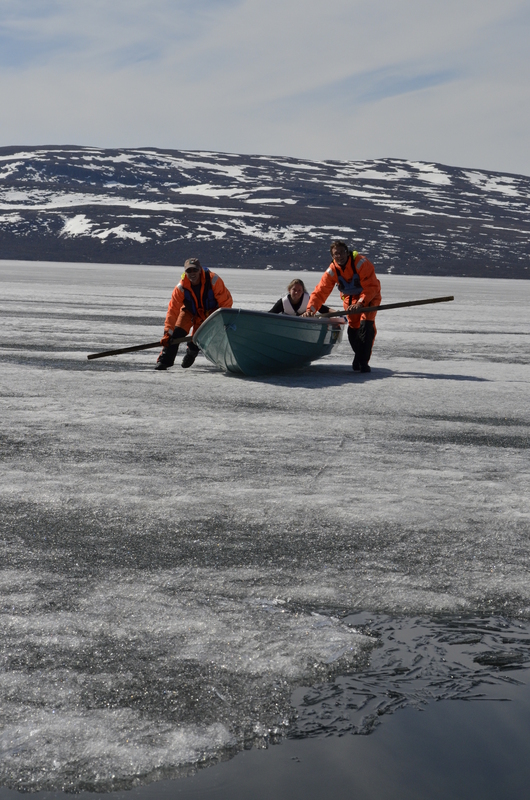 So, a modified boat was pushed across the ice. But again, we didn’t pick up any sign of AUV life. 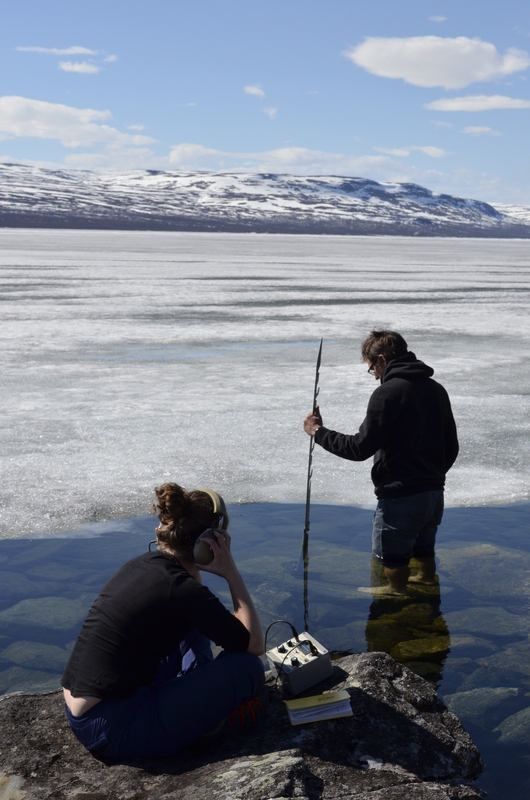 Larry Kost and Alex Forrest giving Kelly Graves and the hydrophone a lift across the lake. Team UBC-Gavia decided to take a short break to regroup and hike the second tallest mountain in Finland, Saana. Plus, they wanted to see if they could spot UBC-Gavia from up there. 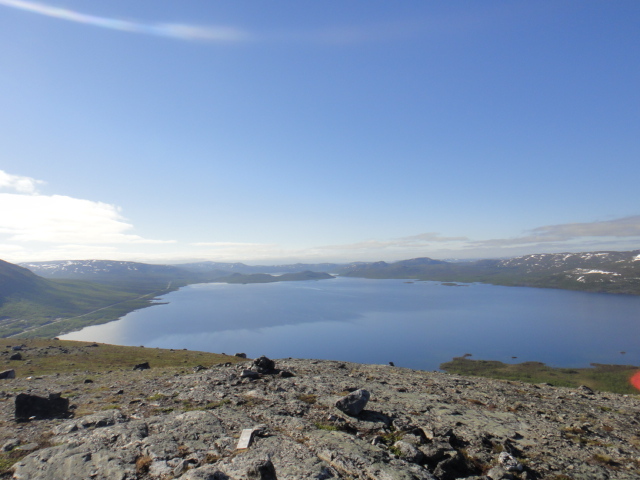 The view of Kilpisjärvi from the top of Saana and no AUV in sight. 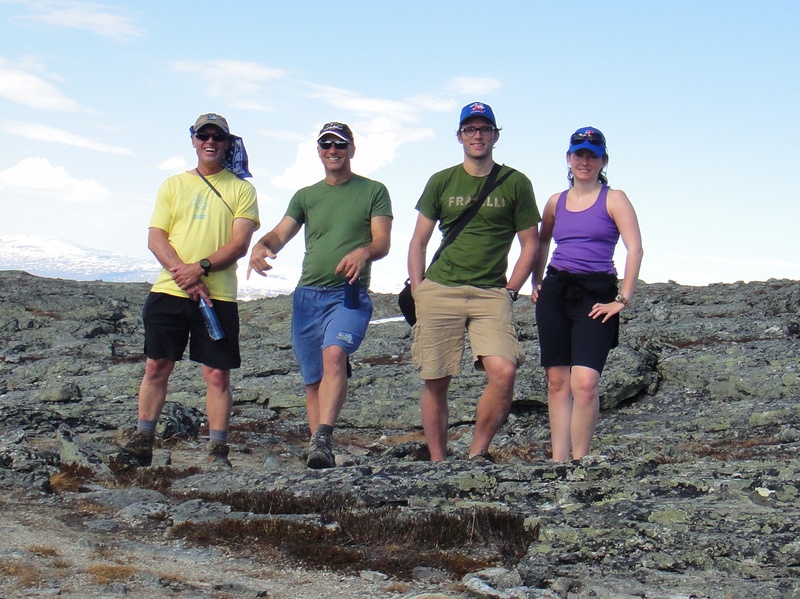 Team UBC-Gavia (Larry Kost, Jeff Williams, Alex Forrest, and Kelly Graves) on their AUV siting hike. 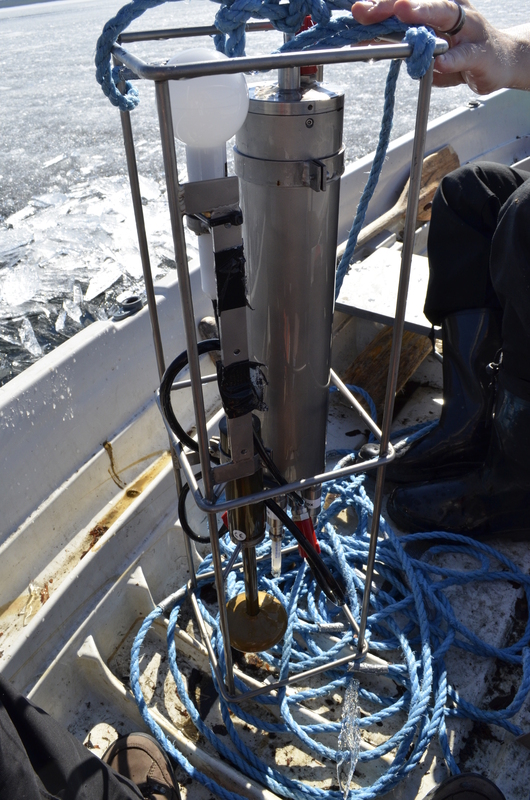 It became obvious that the methods being used would not work, so it was decided that we would continue to take measurements with other instruments. 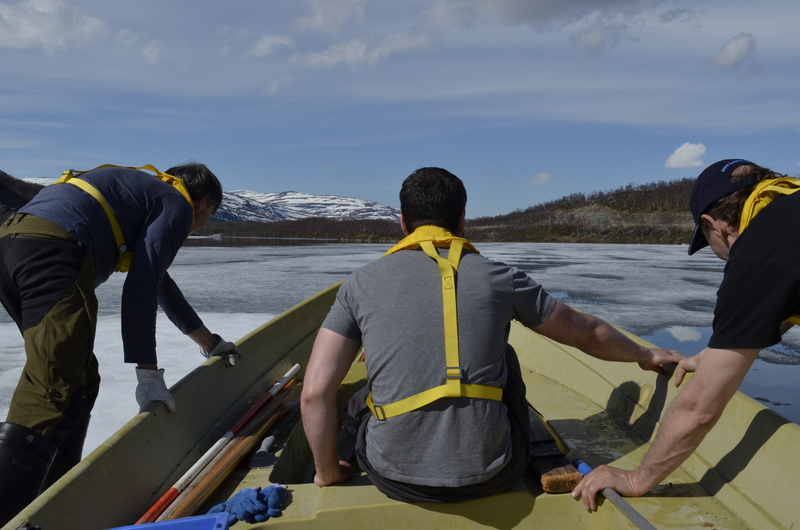 We weren’t giving up on finding UBC-Gavia, but we thought that the chance of recovery would be better when the ice had melted more and the lake had more open water on it. When we were out on the water making measurements, we were always on the lookout for UBC-Gavia’s communication tower, which is clear plastic. It is looks a lot like an ice crystal. So, it would be easy to spot on an ice-covered lake. Not! 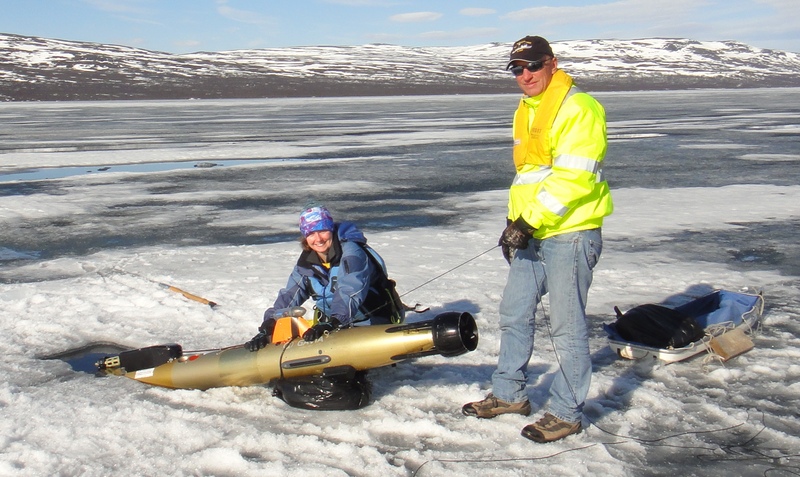 Kelly Graves scanning the ice for the AUV. 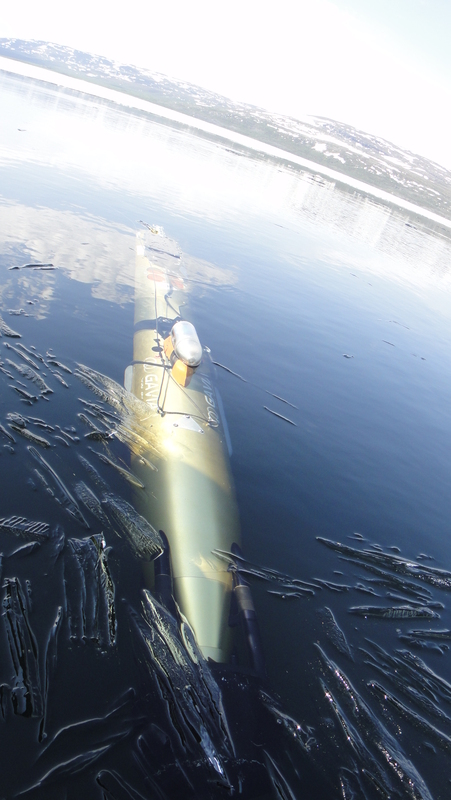 Finally, one last attempt to visually search for UBC-Gavia in open water was launched. And lo and behold, the UBC-Gavia tether line was spotted. So, into the boat we hopped and out onto the water we went. 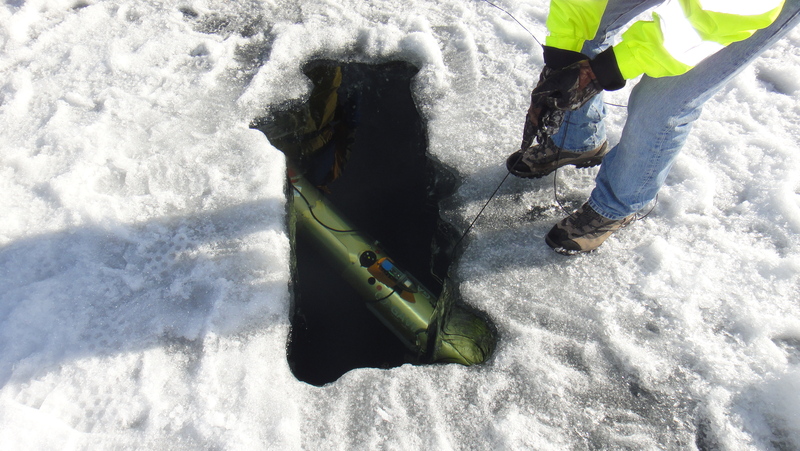 After 100’s of meters of line was pulled in, a gold, torpedo shape fish emerged from under the ice. UBC-Gavia was found! UBC-Gavia finally making her appearance from under the ice. Alex Forrest securing UBC-Gavia to the boat so that she doesn’t go missing again. After seeing that nothing was damaged, Team UBC-Gavia was ecstatic. So, the AUV was hauled into the boat and escorted to shore. Alex Forrest holding on to UBC-Gavia for her trip home. 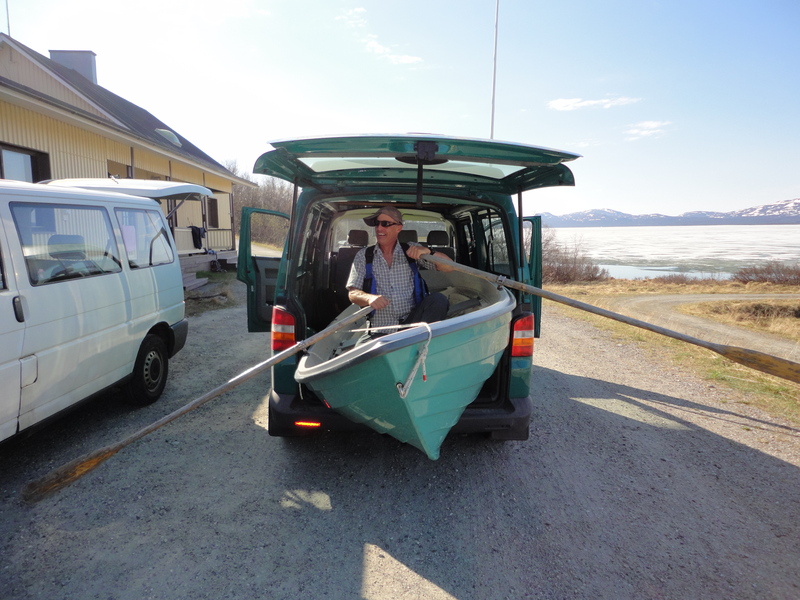 Back on shore, UBC-Gavia was loaded onto her cradle and loaded into the back of the van. 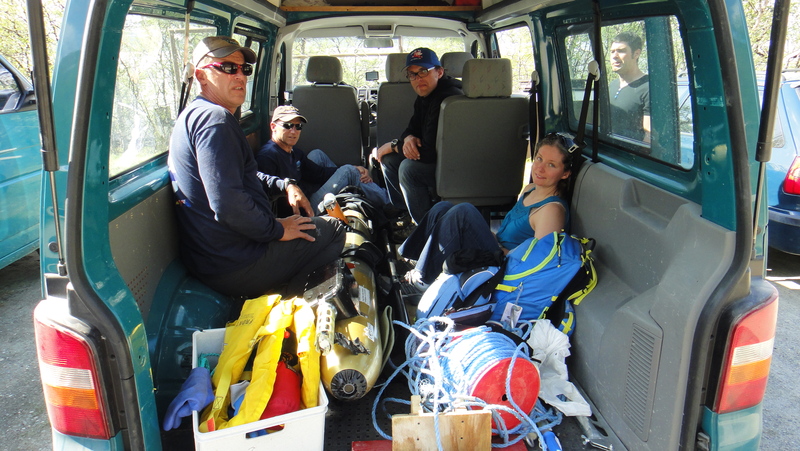 UBC-Gavia and the team (Larry Kost, Jeff Williams, Alex Forrest and Kelly Graves) collapsed in the van for a rest. UBC-Gavia’s position was unknown for 123 stressful hours, and now that she is back on shore, we can’t wait to get her back in the water running missions. Today’s Finnish word of the blog is onnea (Bravo). Flying Through Ice CONCUR Style! 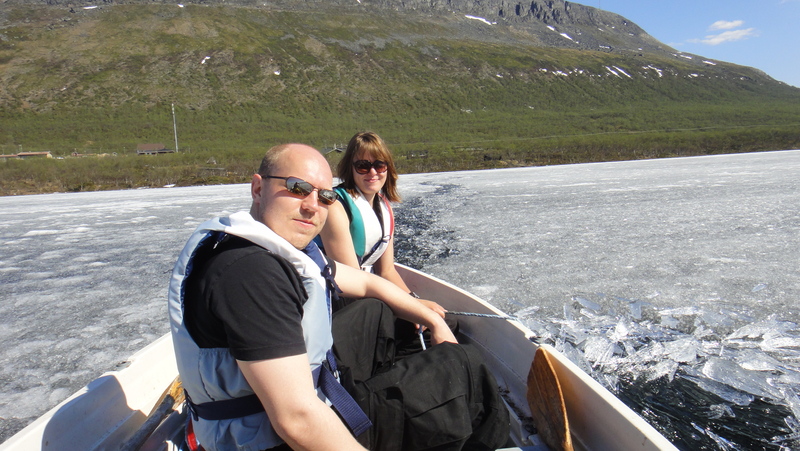 So check out this video of our team flying through jää (ice) with a motor boat. 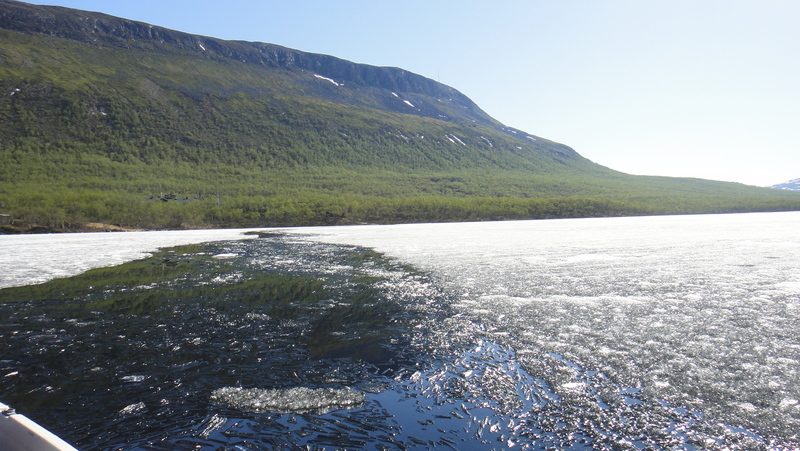 Keep in mind, that a week ago this ice was super thick (50 cm or so) and we were able to walk on it. Now, you can paddle through it and it falls apart. Then, when you put a motor on the back of your boat, you can go for ages. So, what happens when you get high and dry? Well, you call for a lift. Larry Kost hitching a ride from site to site (don’t worry that isn’t actually what happened). Field work is so tough! 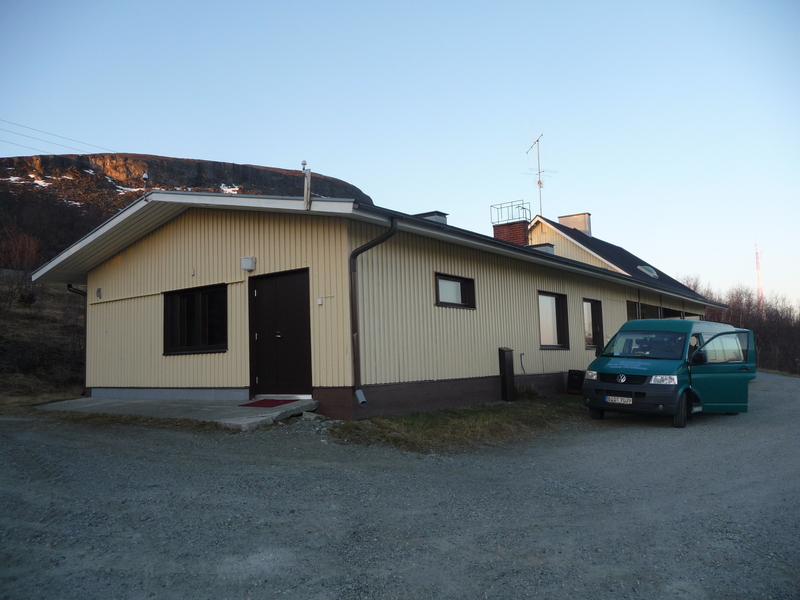 It has been another long work day in Kilpisjärvi, Finland. 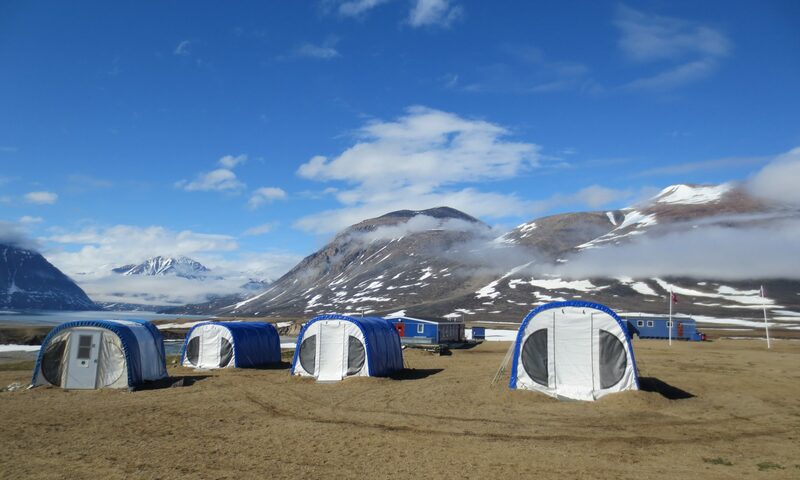 For today’s blog, I thought I would give a quick snap-shot of the field work we have done. One group took measurements of the temperature, conductivity, pressure, pH, turbidity, redox, PAR and current from the surface of the water to the bottom of the lake (essentially everything you could want to know about what is happening vertically in water column). They stayed at one location for 3 hours, and made measurements every 15 minutes. The University of Helsinki’s CTD (CM90) with all its doo-dads. First they needed to paddle out to the site. Then create and ice hole for the instrument to go in. 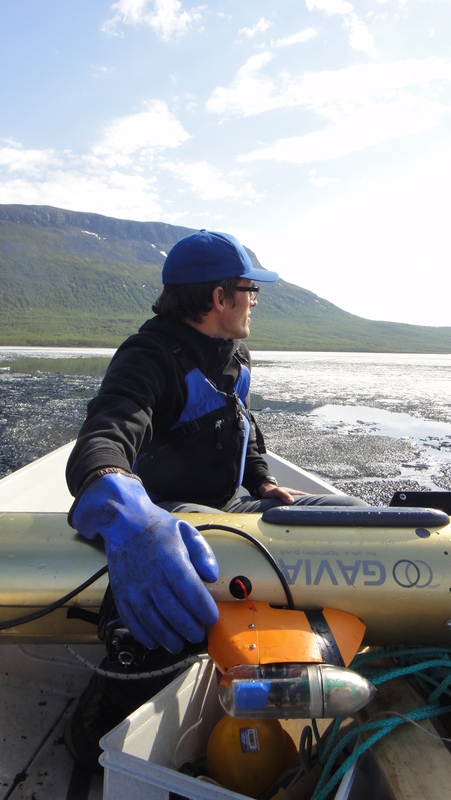 Tom Kokkonen clearing ice for the instrument to get through. It looks easy but that ice is tricky. Lowering and raising the instrument is hard work. In between measurements, there is lots of time to kill, so when you need to make notes, it is really important to be comfortable. Kelly Graves recording coordinates and resting, it was a tough job. It is quite warm here, we hit 30 degrees centigrade today. So, it is important to stay hydrated. Staying hydrated by melting shards of ice in a water bottle. Nothing tastes better. There is also a form of ice fatigue that sets in at a certain point. It can cause people to take photos of almost anything, but ice is by far the best thing. 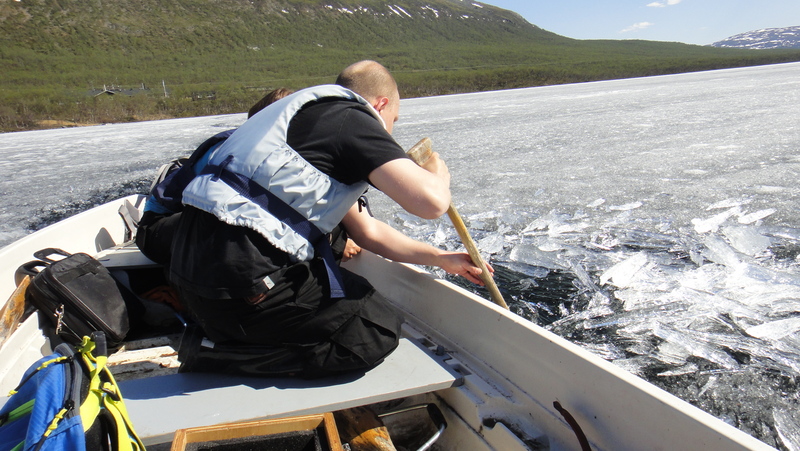 Then, finally the last measurement was taken and into shore they swiftly paddled as to not miss päivällïnen (dinner). It really is a hard job, we just make it look relaxing. 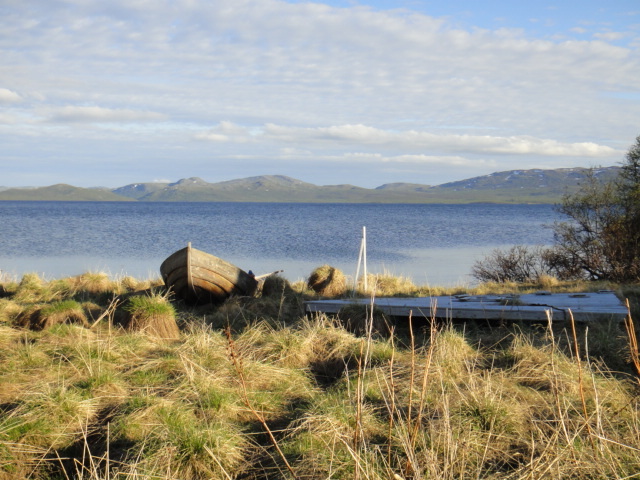 So, since people like pictures so much, I thought I would give you a few to get a feel of what it is like for us in Kilpisjärvi. The following photos were taken by the CONCUR team. To start is off, the thing that brought us here ICE! Now, 8 of us are living in a cottage that has many out-buildings and is right on the lake. Luckily we have room for everyone and most importantly, we have a coffee-maker and a dishwasher. This is our home and transportation for the time that we are here. The animals here are very interesting. The various birds are quite astounding. Reindeer are quite common to see. Also, we have noticed that there are giant bumblebees here, maybe it’s their cold-weather coats that makes them so large. 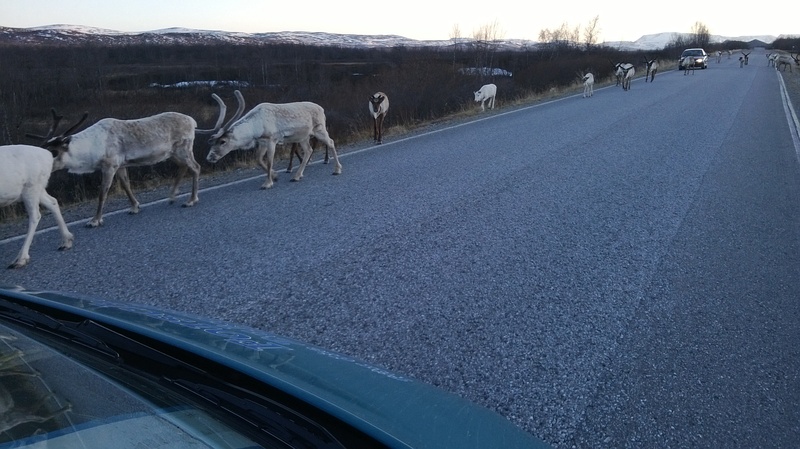 Reindeer relaxing by the side of the road. The ice seems to go on forever. 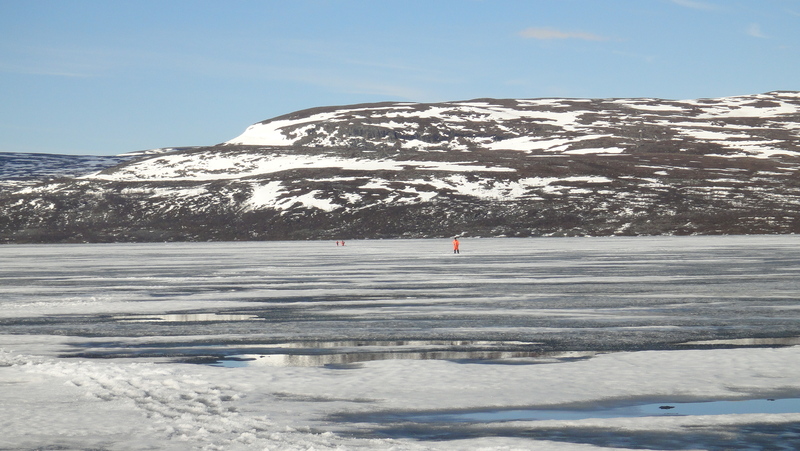 The lake is approximately 7.5 km long and 3 km wide, so it makes for a long walk when you want to sample every 50 m, and you can’t use a snowmobile. CTD team sampling (the orange suits are great to spot). 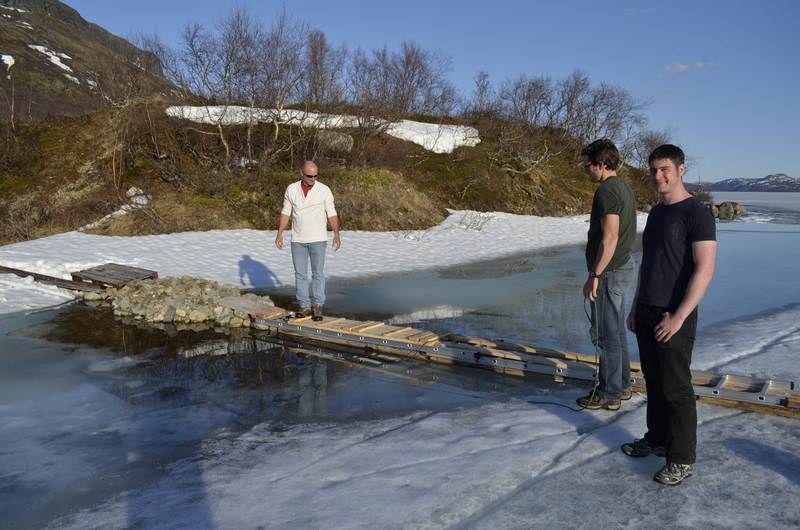 When we arrived, the ice wasn’t touching the shore, so a bridge was built (well another was built later to accommodate the widening gap). Jeff Williams, Alex Forrest, and Will Rizk working hard on the bridge (don’t worry the water was only a foot deep and we had safety measures in place). When access isn’t possible, a boat is always a good option for transportation, especially when you aren’t the one doing the rowing. Kelly Graves and Jeff Williams going for a leisurely paddle. 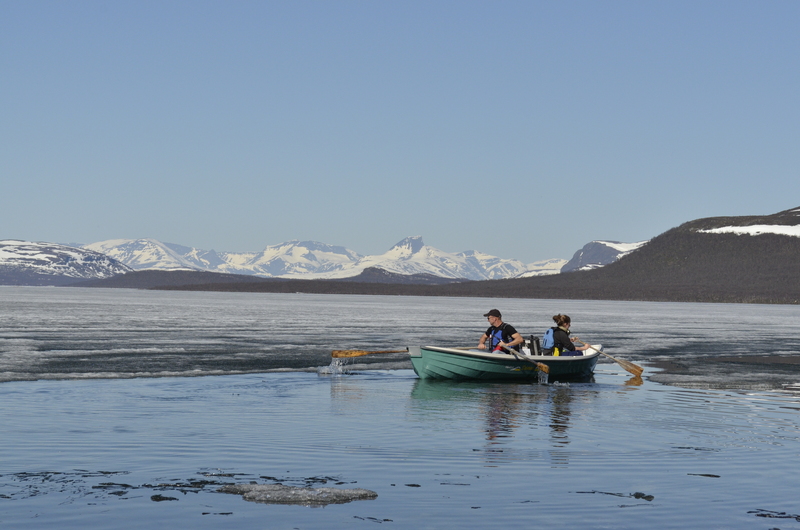 However, when you hit solid ice, it gets a bit hard to paddle, so that is when you push. Christof Engelhardt and Georgiy Kirillin giving Will Rizk and Elisa Lindgren (photographer) a lift across the ice. A great way to pass the time between measurements is taking photos. 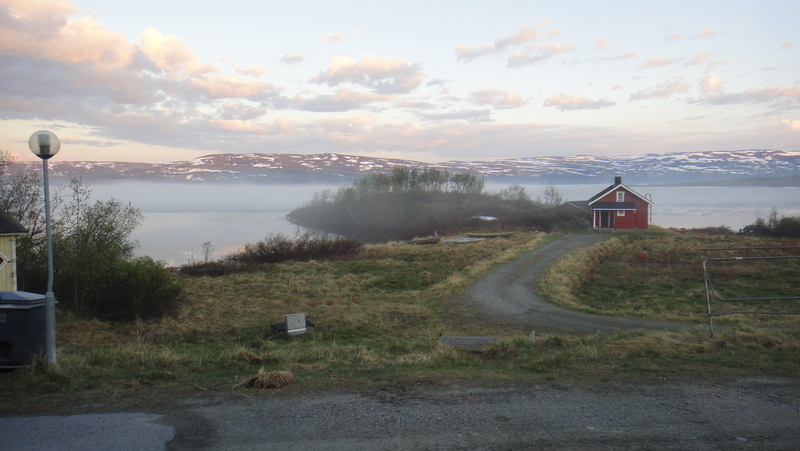 Looking towards Norway across Lake Kilpisjärvi at 9 pm (it’s just the cloud that is making it dark). Well, I hope that gave you a bit of an idea of our experience on our lake. There will be more photos and thrilling posts to come.